Editor’s Note: With nominations for the 2017 Sherman Award for Excellence in Patient Engagement opening in one week, we are pleased to offer this encore presentation from our friends at Meritage ACO. Meritage was a finalist for the 2015 Sherman Award. We hope you will take some time during the coming weeks to nominate your projects focused on improving patient engagement. We have streamlined our process and look forward to reading about outstanding patient engagement work at each of your organizations. “It looks like you’ve had another exacerbation of your COPD. I really would like you to start using home oxygen. And there are some other medications I would like to adjust here…” William hears the ER doctor at Marin General Hospital (MGH) but can’t help letting his mind wander. This is his third time here in as many months. Will the medication adjustments even make a difference? William is overwhelmed, confused, and too embarrassed to ask the doctor to repeat himself, so he just smiles and says he understands. How will he even get home oxygen through his insurance? Which of his doctors should he ask? Will the ER doctor tell them that he needs it? Answers to these questions seem out of reach. Later that day though, a registered nurse named Dorsa visits William at the hospital. She explains that she is with Meritage ACO, and his primary care physician (PCP), Dr. Andrew. William trusts Dr. Andrew, who he has been seeing for 15 years, and feels hopeful when he hears the familiar name. Dorsa says she would like to follow up with a home visit after the hospital, talk to all of his other doctors about his medications, and help him get the home oxygen through Medicare. She will even help him correctly fill his pillbox! Since his wife passed away last year, William has felt like managing his own care is futile. Maybe with someone like Dorsa in his corner, he thinks, he can do it. William is one of over 22,000 Medicare beneficiaries managed by Meritage ACO. When William was admitted to MGH, Mira, one of the Meritage ACO patient care coordinators, received notification from the mobile care navigation network, which Meritage uses to communicate with local hospitals, skilled nursing facilities and providers. Within minutes, Mira sent Dorsa a task via the network to notify her of William’s admission. William is now a part of the Care Transitions program, which was developed by Meritage ACO in response to a lack of unification of the care team and hands-on patient management post-discharge. With a care manager acting as a team leader and a patient care coordinator ensuring patients can utilize all available services through Medicare and their community, patients like William get the most of their healthcare and can avoid another trip to the hospital. Keeping utilization costs down can be challenging in the face of missed appointments, a lack of patient education about self-management or red flags for their conditions, and a lack of medication compliance. The risks of these all increase at times of transition from the inpatient to outpatient setting. In fact, according to the Centers for Medicare and Medicaid Services, 17.5% of Medicare fee-for-service beneficiaries discharged from hospitals are readmitted within 30 days (U.S. Department of Health and Human Services, 2014). 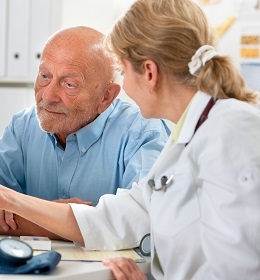 The readmission rate for Meritage ACO Care Transitions patients is just 10.2%. While Meritage ACO nurses like Dorsa help achieve these goals on an individual patient level, the ACO as a whole also needs a comprehensive communication strategy to ensure effective care coordination. The Meritage ACO Care Transitions Program currently includes 250 PCPs and specialists from its own network, the 235-bed Marin General Hospital, two SNFs, the 163-bed Novato Healthcare Center, the 54-bed San Rafael Healthcare & Wellness Center, and Hospice by the Bay, which operates throughout the North Bay. Without a single, unified EHR, our providers were previously forced to communicate via paper faxes, pagers and phones, which can often result in confusion among patients and providers at the time of discharge. However, by putting a secure, HIPAA-compliant mobile care navigation network in place, care team members have an easy method to remotely coordinate care across multiple facilities. It enables them to collaborate on evidence-based transition plans and follow up with patients post-discharge. The mobile care network makes it easy to build a care team around a patient. Once the team is built, it is easy to identify clinicians and others based on their role and location. Team members can send and receive secure, patient-centered text messages 24/7. Messages can connect individuals or the entire team. The network enables the care team to confirm their sent messages have been opened and read. This communication strategy not only helps the care team better manage the patient, it conveys a united front that increases patient satisfaction. With a care team that encompasses the patient’s PCP and treating nurses, therapists and physicians in the hospital or the Emergency Department, and the skilled nursing facility making collaborative, evidence-based decisions, Meritage ACO participants are given as many tools as possible to effectively manage their health. Patients like William, who previously saw their healthcare as an insurmountable obstacle, can engage their care team as valuable allies in learning to successfully manage their health and their safety at home. Andrea Kmetz, BS, RN is the Director of Care Management and Quality Assurance at the Meritage Medical Network and Meritage ACO. She is responsible for multidisciplinary complex case management and care transitions coaching for 41,000 enrollees as well as multitude of quality initiatives. Marie Robertson, BS, is Quality Management Coordinator for the Meritage Medical Network and Meritage ACO. She works with Andrea to implement quality assurance initiatives in addition to coordinating community wellness programs, CME events and other projects.